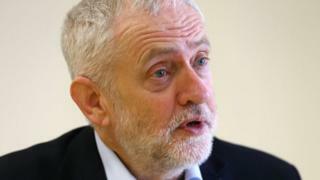 Jewish community leaders have agreed to meet Jeremy Corbyn to discuss his efforts to tackle anti-Semitism in the Labour Party.But the Board of Deputies and the Jewish Leadership Council have repeated their warning to the Labour leader that action is needed "not words".The details and date of the meeting have yet to be decided.Mr Corbyn said earlier he would meet the leaders of the two groups "without any pre-conditions".He has been calling for such a meeting for more than a week but the two groups had refused to set one up until he agreed to "an agenda of action for discussions". These include a commitment from Mr Corbyn to publicly back MPs who were criticised for attending a protest rally against Labour anti-Semitism. In a letter to the groups earlier on Wednesday, Mr Corbyn said: "I place no limitations on the points you would wish to raise and happy for the agenda to cover the issues you've already outlined. "He added: "I appreciate and understand the anger you express and reiterate my determination to fight anti-Semitism within the Labour Party and society at large. "In their response, the Board of Deputies and the Jewish Leadership Council said: "Our community has followed the events of the past few weeks closely. "You will appreciate that some of what they have seen has not been reassuring. "They said it was "crucial" that Mr Corbyn uses his "own personal authority as leader of the Labour Party to drive the changes required" but that "the most important thing going forward will be action and not words".They agreed to Mr Corbyn's suggestion that Labour's new General Secretary, Jennie Formby, should take part in any meeting.The letter is signed by both Jonathan Arkush, President of the Board of Deputies and Jonathan Goldstein, Chair of the Jewish Leadership Council.Mr Corbyn was criticised by the two groups for attending a dinner on Monday held by Jewdas, a "radical" left-wing Jewish collective which has previously suggested claims of anti-Semitism in Labour were a political plot to discredit the party leader. On Tuesday, Mr Arkush said: "If Jeremy Corbyn goes to their event, how can we take his stated commitment to be an ally against anti-Semitism seriouslyThe Board of Deputies and the Jewish Leadership Council wrote to Mr Corbyn last Wednesday setting out what they wanted to see from a meeting with the Labour leader.They called for Mr Corbyn to take "personal responsibility" for the work being undertaken by the party to tackle anti-Semitism and to resolve cases to a "fixed timescale".They also urged a ban on Labour members and MPs sharing platforms "with people who have been suspended or expelled for anti-Semitism".And they called for improved education about anti-Semitism, including a "clear list of unacceptable language".They also want an independent ombudsman to oversee efforts to tackle anti-Semitism in Labour, with regular updates to be given to the party and to Jewish community leaders.Protesters, including several Labour MPs, gathered in Parliament Square last Monday to demand tougher action from Mr Corbyn on anti-Semitism, under the banner "enough is enough".A smaller counter-demonstration by the Jewish Voice for Labour group claimed the Labour leader was the victim of a "witch hunt" by his political opponents.Jewish leaders said Mr Corbyn had not done enough to condemn the "abuse and insults" they say had been directed at Labour MPs who had backed their protest. "They need to hear you say, publicly and in your own voice, that we had every right to protest about anti-Semitism," they told Mr Corbyn in last Wednesday's letter.